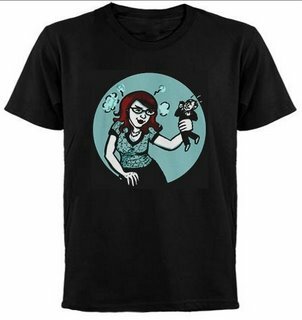 Alternative cartoonists joining forces, conquering world, making T-shirts. Etc. Ever want to read the blogs of a bunch of your favorite altie cartoonists all in one place? Well, now you can. Members of the group include Ted Rall, Keith Knight (he's not on the site yet but will be), Matt Bors, Stephanie McMillan, Jen Sorensen, Brian McFadden, August Pollak, Masheka Wood, and me. Our brand-new website just went live Monday, and we have plans to do a group book signing in DC this October (right before the Small Press Expo). We're also making T-shirts. Would you wear this shirt? If so, let me know--I have to figure out how many to order. So say you're a crapbag excuse for a president who was playing air guitar and eating birthday cake while thousands of people drowned and lost their homes and livelihoods and loved ones. And say many of the people thus affected were black and poor. And say you didn't really do a heckuva job getting them housing or jobs or rebuilding their city. And say it's a year later, and you want to reach out to them and show them you care, that you understand, you really understand? How do you express your loss to all these (largely black and poor) survivors? "It's hard to describe the devastation down here," he said. "It was massive in its destruction, and it spared nobody. U.S. Sen. Trent Lott had a fantastic house overlooking the bay. I know because I sat in it with he and his wife. And now it's completely obliterated. There's nothing...."
Because nothing says "I feel your pain" like longing for racist lemonade and fancy real estate. Meanwhile Lott is sitting pretty in the Senate and living in one of his other homes, and Katrina's real victims are stuck in trailers. Out of the rubbles of Trent Lott's house -- he's lost his entire house -- there's going to be a fantastic house. And I'm looking forward to sitting on the porch. P.P.S. Spike Lee's HBO documentary When the Levees Broke made me sob like a baby. I highly recommend it, just be sure to have tissues at hand. P.P.P.S. Get your Attack of the 50-Foot Mikhaela T-shirts and/or tank tops while they're hot! Jen has the goods on George Allen, decorative noose and all. A whole bunch of new products in the shop, get them while they're hot! Hello, I'm a 15 year-old lesbian girl in a (utah) mormon family. I'm scared to come out, but I liked reading your comics a lot. This isn't even my e-mail address I use for family because I'm so damn scared of what might happen. But anyway, I really liked your comics. Can you put me on the mailing list? Thanks. 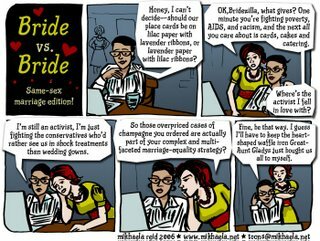 Many people have sent us your fabulous cartoon What to Expect When You are Pre-Expecting. You and our organization, National Advocates for Pregnant Women are definitely thinking along the same lines! For example, in a booklet we prepared about pregnancy and employment discrimination we point out that one of the things too many pregnant women can expect is this kind of discrimination. Among the many things we do at NAPW is challenge the arrests of pregnant women and new mothers and other punitive actions that you touch upon in your cartoon. I hope you will have a chance to look at our website -- www.advocatesforpregnantwomen.org and a sample commentary below the signature line. I just wanted to let you know I love your cartoons. I am a 40-year old caucasian male, middle-class, midwesterner, budget analyst for an industrial coatings company and yes, I actually have brown paneling in my office (are you still awake?). I know many people who are, like me, middle-class accounting nerds who share your views on the environment, social policy, war, and everything else that appears in your cartoons. Thanks for all of the good work that you do. 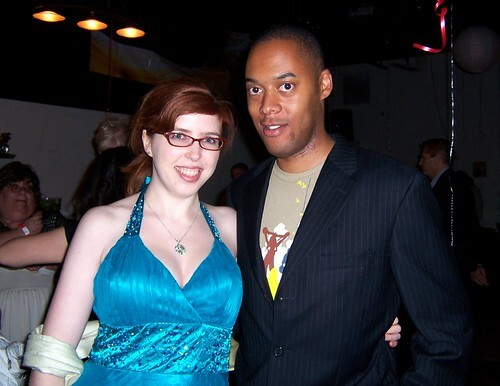 Also, congratulations on your wedding! Aw, I'm blushing. Keep the letters coming, folks! I've been looking for a totally gratuitous reason to make a nonsensical Project Runway reference, and I finally found it in the conservative hawkish bundle of obnoxiousness that is Joe "Independent Democrat" Lieberman. Matt doesn't ask or tell, baby. For all those of delicate sensibility, Brian presents The Classy Dozens. Stephanie is like, totally embarassed. Scott finishes his Bateman 365 animation a day project--watch 'em now before they're off-line and only available on DVD. Jeff Danziger makes a very simple point. Keef celebrates Life's Little Victories, New Orleans style, and gets in a dark mood. David Rees earns his wages. 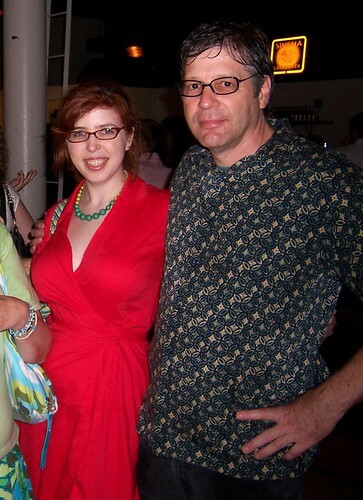 New Cartoon: " Bride vs. Bride"
Me and my dad at the Real Hot 100 art opening (click photo for whole set). If you're wondering why our hair is wet, we got caught in a thunderstorm walking to the gallery. 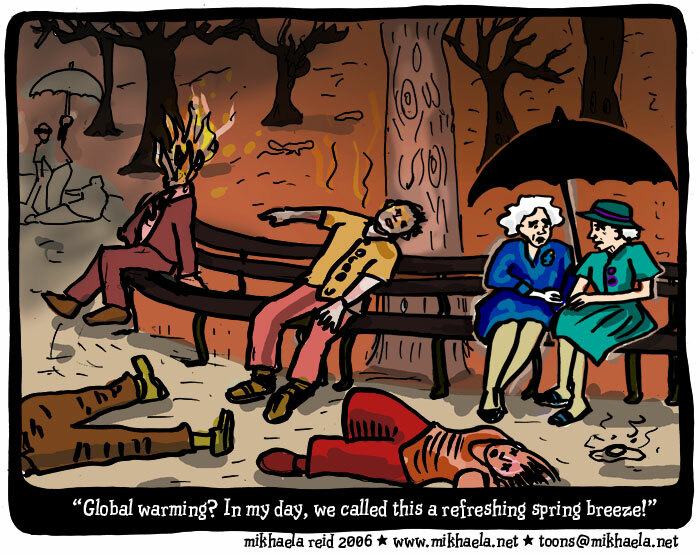 New Cartoon: "What Global Warming?" 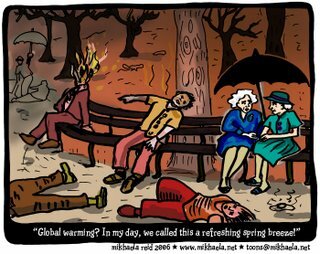 Plus: Masheka rides the heat wave This is my response to the ridiculous conservative talking point that liberals are so dumb they confuse "global warming" with "summer", especially as expressed in this deliberately ignorant cartoon. Also, Masheka is really sweaty. And Stephanie has another good global warming toon. 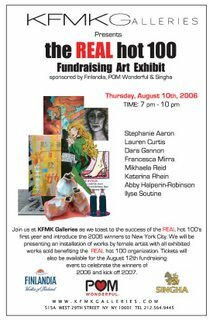 Real Hot 100 fundraising art show Thursday night in NYC! 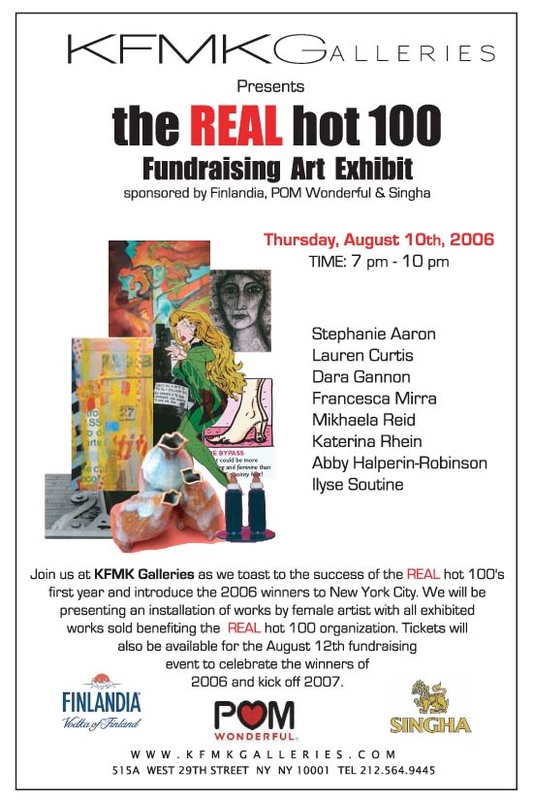 When: Thursday August 10, 7-10 p.m. Please help support The Boiling Point! My latest few cartoons turned out to be pretty popular, so a big hello to all you new readers! And for readers old and new, remember that you can buy books, prints and originals. If you're interested in a high-quality signed archival color limited-edition print of any of my cartoons, prices range from $15 for an 8 1/2 x 11" print to $35 for a 13" x 19" print. I also still have the originals of many of my cartoons for sale (here are some examples of what the originals look like), most for $160, but some single-panel cartoons are just $120. Just email me letting me know which one you'd like to buy (list an alternate or two just in case) and I'll let you know the price and details. All originals come with free color prints. And of course, if you know any editors... encourage them to pick up my cartoon. I lost quite a few clients recently due to various unfortunate circumstances (changing editors, changing design, etc.) and I really need to expand my audience (and my paycheck--I lost the majority of my cartooning income when I lost the Boston Phoenix as a client). New Cartoons: "Condi Looks at the... Brighter Side of Middle East Violence" and ">"Car Confessions (Mitt Romney Makes Like Mel Gibson"
It's been pretty obvious for about, I don't know, FOREVER, that Mel Gibson is a hateful right-wing anti-Jewish Holocaust denier, but I guess for some people it took him letting his true colors show in a drunk driving incident to make it totally clear. So I thought... what if all kinds of other politicians ruined their careers by revealing their all-too-obvious-but-apparently-not-obvious-enough bigotry in drunk driving incidents? 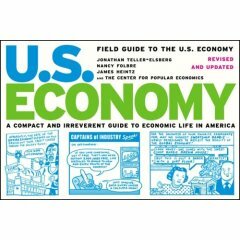 Field Guide to the U.S. Economy: A Compact and Irreverent Guide to Economic Life in America, Revised and Updated Edition. I must say I'm biased, since I have several cartoons in this book. But it's a great guide that makes complicated economic concepts easy to understand with some help from cartoons by Tom Tomorrow, Jen Sorensen, Stephanie McMillan, yours truly, and more. Available now. 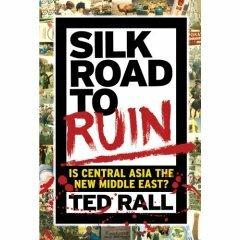 Ted Rall's latest book, Silk Road to Ruin: Is Central Asia the New Middle East? is a must-read, especially now. It's not in stores yet, but I had the privelege of reading the proofs, and it's a gem: part graphic novel, part travelogue, with indepth guides to each of the countries in this volatile, crucial, yet often overlooked part of the world.